Your votes helped select Suddenly Samantha Salon as the recipient of the 2018 Independent We Stand, Independent Small Business of the Year Award! Located in Easton, Pennsylvania, Suddenly Samantha Salon does more than give local residents a fresh cut. It also gives the community’s neediest members a fresh start. The locally owned salon and its owner, Stephen Flowers, have become known in the community for providing free haircuts and other resources to those in need. For example, Flowers spends each Christmas Day at the salon, welcoming in the community’s homeless residents for a free haircut, a fresh meal and some much-needed warmth. Flowers also comes in on Mondays, his day off, to provide free haircuts for the homeless. During the back-to-school season, Flowers offers free haircuts to school children to get them ready for their first day. For some children, it’s the first professional haircut they’ve received. During this time, Flowers also collects donated school supplies to provide the kids with the tools they need to succeed. 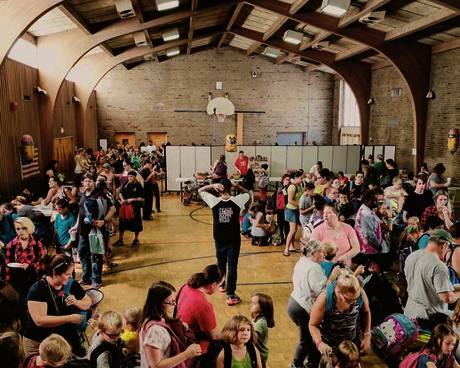 The back-to-school program provides more than 300 children with free haircuts and collects more than 150 backpacks filled with school supplies. Another great example of a locally-owned small businesses creating local memories and lasting impact in their community. Congratulations to Suddenly Samantha Salon!